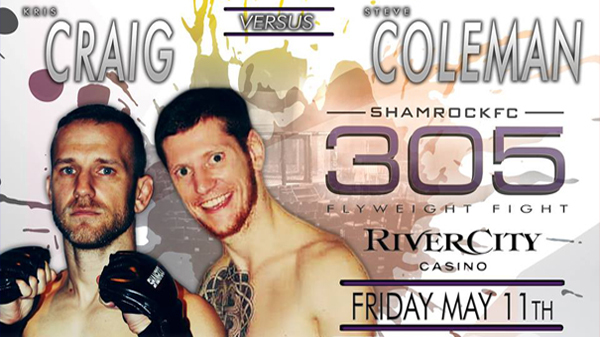 Two talented and seasoned flyweights will kick-off the main card Friday night for Shamrock FC 305 at the River City Casino. Both Steven Coleman and Kris Craig put together long, storied amateur careers, combining for nearly 40 amateur fights, and now on the cusp of their venture into the pros, the two will meet for the first time. Coleman (1-1) will look to stymie the forward-pressing Craig, who is making his pro debut. Coleman made his MMA debut in April 2014 for Fight Hard MMA. He fought for eight different promotions before making his pro debut in June 2017, when he submitted Ray Allard in the third round. Two months later, Coleman suffered a decision loss to Sheldon Smith. Aside from a three-year stretch in Montgomery, AL, 26-year old Coleman, has spent all of his days in St. Charles County. He was never much of an athlete in school, dabbling in baseball, cross country and track along the way. Coleman began training under TJ Mohler for purely self-defense reasons. Once things started to connect, he began competing in jiu-jitsu tournaments and then before he knew it, he made his first step into the cage where he won a unanimous decision in front of a big crowd at the Family Arena. Though just two fights into his pro run, Coleman is well aware the need to continually improve and to tinker. Though both have been around the block, notoriety is just now starting to come to Coleman and Craig. In pre-fight banter, Craig (who is known for his wrestling) has suggested that the two should make Friday's bout a punching and kicking affair only. But Coleman isn't buying it. Coleman currently puts in anywhere from 60-70 hours a week as a lead supervisor at a factory and has a four-year-old daughter. Though making his pro debut, Craig is no up-and-comer. At 37-years-old, this financial planner knows his competitive time clock is ticking away. In wrestling, Craig was a four-time state qualifier at Pattonville and placed third in state as a senior. He went on to wrestle at Meramec College. MMA was an afterthought in Craig's mind mostly due to, at the time, when he finished college, there wasn't much an avenue for a lighter-weight fighter. Craig's grappling connections eventually led him into jiu-jitsu where he was successful as a white and blue belt. 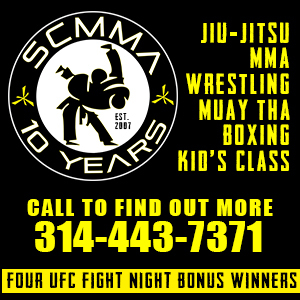 Fighting out of Finney's MMA, Craig eventually became a former Shamrock FC title holder and has fought exclusively for SFC his entire career. His amateur career is dotted with a couple of wins here, followed by a loss, back and forth never sustaining a dominant streak. He has landed and has been on the receiving end of wicked knockouts. The ups and downs were precisely what he was looking for in his ammy run. The fact that Coleman and Craig haven't met before is something of an anomaly. Flyweight standout Corbin Howard wrecked the plans of the two facing off last year when he defeated Coleman at the beginning of 2017. Howard got the eventual title match with Craig and won spectacularly via KO. There is nothing easy about putting away Coleman, who was rarely – if ever – finished as an amateur. After several years of handling its own pay-per-views, Friday will mark Shamrock FC's debut on the Flo Combat network. For more information on how to watch, visit FloCombat.com. Ticket information can be found at the Shamrock FC store.